This is my book review for MCBD 2018. On this exact same day (Jan 27th) in 1967, Apollo 1 swallowed up three NASA astronauts. NASA came out with a plaque: A rough road leads to the stars, to learn from the tragedy and to stay inspired. The quote, however, aptly captures the spirit in the lives of the women this book explores. In a time of social and cultural oppression in America, in a time when few women pursued higher education or worked in STEM, in a time when racism was rampant, in a time when the nation raced to reach the moon, brilliant black women persevered and succeeded, but were never celebrated. This sums up why we need this book – why it is important for us, and children in particular, to read the book. 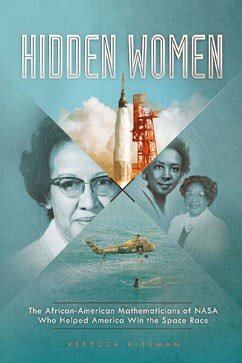 The chapters in this book offer detailed accounts of the invaluable contribution of six women in particular – Katherine Johnson, Miriam Mann, Mary Jackson, Dorothy Vaughan, Annie Easley, and Christine Darden. They were “computers,” engineers, programmers, and excellent mathematicians. But they were also strong women that fought gender and color discrimination every single day at work, in spite of NASA’s scientific quest heavily relying on their technical expertise. As we read through their work spanning more than two decades collectively, from the 50s to the 70s, we get great insight into both America’s Space Race (with the Soviet Union) and into the era of segregation. Rissman’s writing is lucid, making it a great read for children. The language is powerful and motivational in many instances. The book also does a good job of covering historical space-related events and provides the big picture where the work of these ‘hidden’ women made a difference. It also presents several anecdotes to show kids how racial bias affected their careers. The most wonderful feature is the inclusion of real photographs – they are fascinating, and help kids connect with the story. The epilogue is an overview of the work of women in recent times that continue to break gender barriers in Space Engineering. The book ends with relevant back matter. 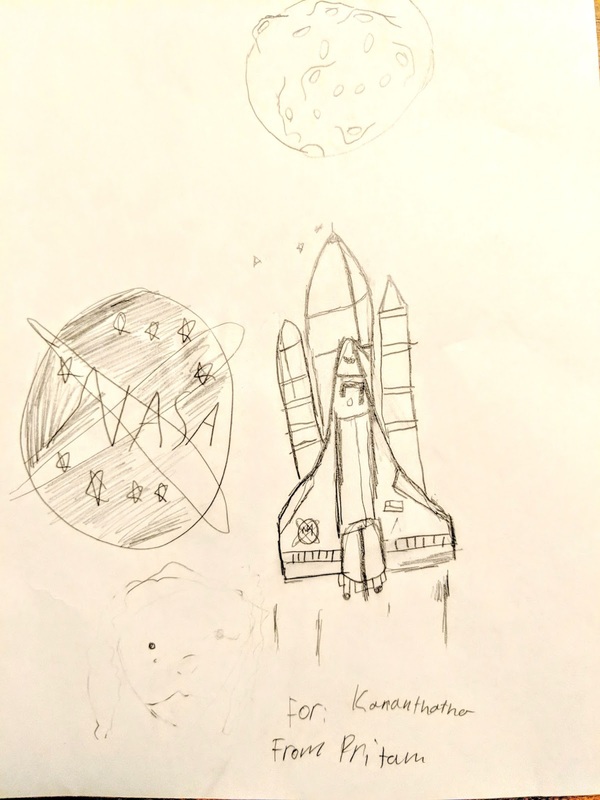 My 9 -year-old son made some artwork right after we finished the book, and dedicated it to his grand-uncle, a mathematician, who contributed to India’s Space Research Organization for decades. Similar in essence to the popular movie, “Hidden Figures,” and highly relevant in the current social and pollical climate, this book is a timely and empowering read for children. We need many such books to fill up our bookshelves in homes, schools, and libraries. Note: This book was sent to me by Capstone Press towards MCBD, in an effort to promote multicultural literacy. But the decision to review it was mine.